Jam on and on (and on) with the same premium electric bass guitar strings that experienced players worldwide trust to keep their incredible tone longer than any other string available. Specially developed based on in-depth feedback from more than a thousand bass players just like you, our tailor-made selection of bass strings proudly includes nickel-plated and stainless steel construction options, four-, five- and six-string sets, long and extra-long scales, and virtually every gauge range you could possibly need. All with our innovative string coating technology. And unlike other string brands, Elixir Strings coats the whole string. This protects not only the outer string surface but also the gaps between the windings where common tone-deadening gunk typically builds up in other brands’ coated and uncoated guitar strings. Who wouldn’t love more quality playing time between the hassle and cost of string changes? Premium by design, these electric bass guitar strings constructed with nickel-plated steel wrap wire boast a rich, rounded tone with incredible clarity and a heavy mid-range presence. Meanwhile, the ultra-thin NANOWEB Coating, redesigned specifically for bass guitars, allows a smooth, natural feel that also enhances grip and reduces finger squeak. 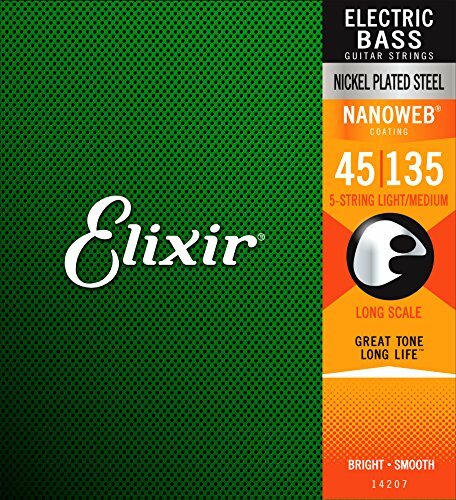 For a brighter bass tone, try our Stainless Steel Bass Strings with NANOWEB Coating. Of course, the kind of string you play is all a matter of personal preference. Not sure what tone is right for you? Try them out for yourself, and find your new favorite string from Elixir Strings. For a more in-depth look at what makes our strings so special, scroll to the branded info further down the page. Elixir Strings: Great tone. Long life. If you have any questions about this product by Elixir Strings, contact us by completing and submitting the form below. If you are looking for a specif part number, please include it with your message.